New York Gov. 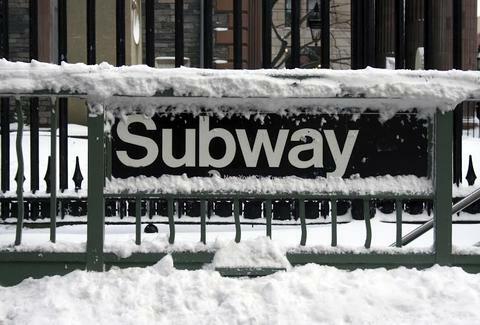 Andrew Cuomo announced during a special weather briefing Monday there will be "limited service" across the NYC subway system beginning at 7pm Monday night and that both the Metro North and LIRR trains will end at 11pm. Cuomo didn't specify what "limited service" would entail, but that MTA officials will be in the process of starting to "put the trains away." Additionally, Cuomo declared parts of New York State — including New York City — under a state of emergency, which will allow state agencies to waive some laws and regulations and act faster to respond to the storm, he said. Cuomo said officials are also considering a travel ban on all main roads at 11pm, depending on determinations following another weather update this afternoon. The service changes and cancelations come as no surprise ahead of what has been described as a "crippling" and "potentially historic" storm. New York City is expected to see snow accumulations of 18in to 24in (with higher amounts in some places), wind gusts up to 55mph, temperatures in the low 20s, and dangerous whiteout conditions, according to the Blizzard Warning from the National Weather Service. As of Monday morning, over 5,000 flights on both Monday and Tuesday had been canceled nationwide due to the impending storm, USA Today reported. On Sunday, Cuomo sounded the alarm on the storm, urging New Yorkers to stay home on Monday as the storm is expected to intensify ahead of the evening commute. Additionally, the governor had already warned of potential public transportation closures, such as LIRR, PATH, Metro North Railroad, and MTA subway trains, as well as buses. Mayor Bill de Blasio said, "We are facing most likely one of the largest snow storms in the history of this city," during a press conference on Sunday. Just prior to Cuomo's press conference, New Jersey Gov. Chris Christie announced that he has declared a state of emergency for all of New Jersey and urged people to stay home Monday night and Tuesday. In Connecticut, Gov. Dan Malloy said that because of the storm, officials will issue a statewide travel ban at 9pm Monday. New York Mayor Bill de Blasio declared a winter weather state of emergency, ordering that all non-emergency vehicles are banned from city streets beginning at 11pm and until further notice. "Recognize this as an emergency," de Blasio said during a press conference. "This is not business as usual." Mayor de Blasio said over 1,800 snow plows have been deployed and that the city has a total of 2,300 vehicles with snow plowing capacity. Additionally, the mayor said all city parks will close Monday at 6pm and that public schools will be closed Tuesday. "Best thing to do: stay indoors, stay off the roads, stay off the sidewalks," de Blasio said. Shortly after his afternoon press conference, Gov. Cuomo released a statement with more information on the state's response to the storm, including some details on the NYC subway service disruptions Monday night. Subway service will run until about 8pm, but service may be reduced or suspended as the storm worsens as the MTA moves trains underground onto the system's express tracks, according to the statement. "If conditions continue to deteriorate, New York City Transit may preemptively suspend service if it becomes increasingly clear that operating trains becomes unsafe for both customers and employees," the release states. Bus service may also be reduced as ridership declines during the storm. Amanda Kwan, a spokeswoman for the MTA, told Thrillist that MTA officials are in the process of determining any further service changes, such as the suspension of some subway lines. "What we can say now is that after 8pm tonight, there will be only local service," she said. Tony Merevick is Cities News Editor at Thrillist and can’t wait to hide inside under the blankets with some cheap red wine. Follow him on Twitter @tonymerevick.